In 2009 I shared my big picture analysis, investment forecast and strategy in a book called “NEW WORLD ORDER ECONOMICS – What you can do to protect yourself”. In January 2009 I forecasted that the Dow Jones Industrial Average was going to make a bottom within a couple months which it did. I also predicted the price of gold to start another major rally, and for crude oil to bottom and rally for years, which were also correct. 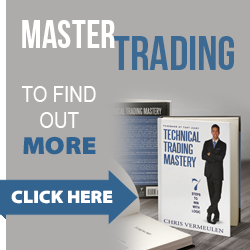 You can call it luck, skill or a mix of both… but the truth is that the markets cannot be predicted with 100% certainty. 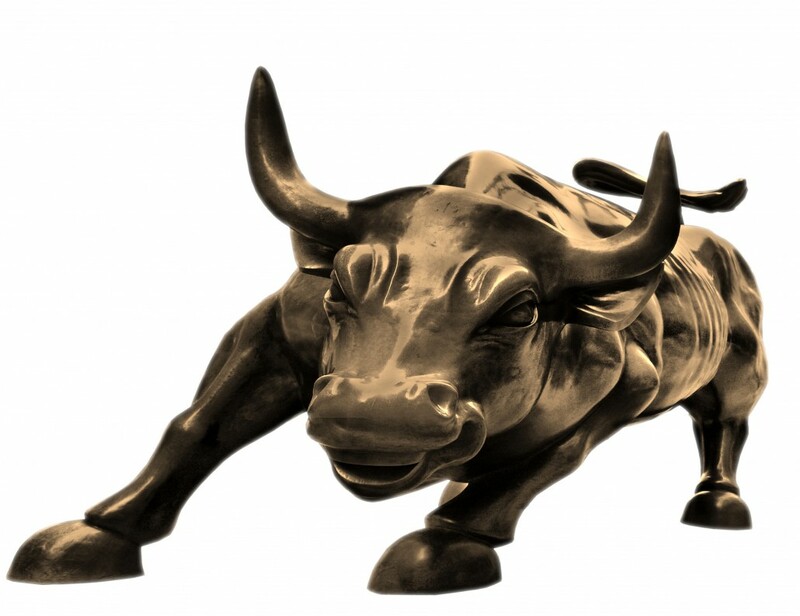 With that said, the US stock market, gold and oil look to be setting up for their NEXT BIG multiyear moves. Crude oil and energy stocks are tricky to navigate in a situation like this where the equities market is nearing a bull market top. It is critical to remember that when the US stock market turns down and starts a bear market virtually all stocks and commodities will fall in value including oil and energy stocks. Investors need to understand that even though the price of crude oil is nearing a bottom it could and will likely stay low for a considerable amount of time “IF” the stock market turns down. Over the last 100 years we have seen nearly 30 bear markets. The average length of a bear market is 18 months and has an average decline of 30%. I do feel currency problems and a war breakout will be bullish for both oil and gold. So if we get a bear market in equities, and a war oil and oil should rally while stocks in general fall. But if we do not have those sever crisis’ then if gold and oil break below their critical support level which is the red line on the charts and a bear market in stocks start you do not want to be long stocks or commodities. 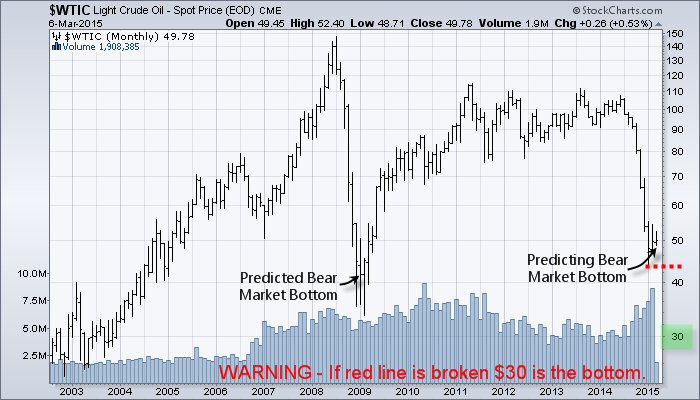 The chart below shows the line in the sand for the price of crude oil. If this level is broken with a monthly bar close below $43 per/barrel I think $30-$33 will be the next stop and the low for the oil market. It seems everyone is bullish on precious metals and have been buying like crazy. The points I made about gold which I talked about in PART II should be reread because if the support levels are broken oil will fall 40%, and gold another 35% from their current prices. 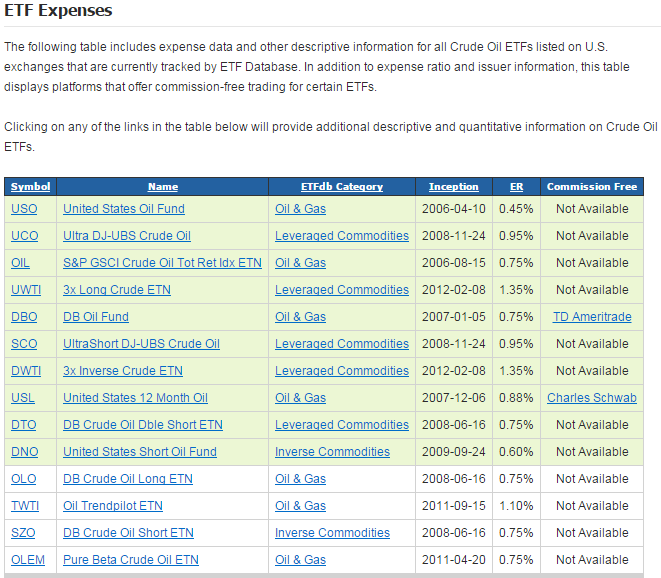 Below are some ETFs that takes advantage of rising oil prices. While there are other funds that cover oil stocks I feel they may not perform well during the equities bear market. Investing in physical oil is the best play at this stage of the game but when the equities bear market looks to be nearing an end, energy stocks will be the best place to invest. In short, I feel crude oil will has or will find a bottom within the next couple months. Long term the value is great, but we must be aware that if equities start a bear market it will be best close all equity positions and wait for the bear market to subside. When the time is right investing in crude oil and energy stocks which pay high dividends will generate life changing gains and an income stream. Patience is the key. 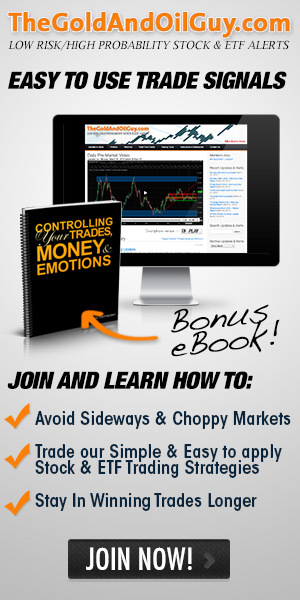 I hope you enjoyed this three part series which covers how to invest in indexes, gold and oil.